Beginning last Friday (13th), visitors to Wisconsin Dells can enjoy a unique experience as Wisconsin’s first Ice Castle opens to the public. Composed of thousands of icicles, 10-foot thick walls, and embedded lighting, the 30-foot tall, 25-Million pound 1-acre structure is a sight to behold. 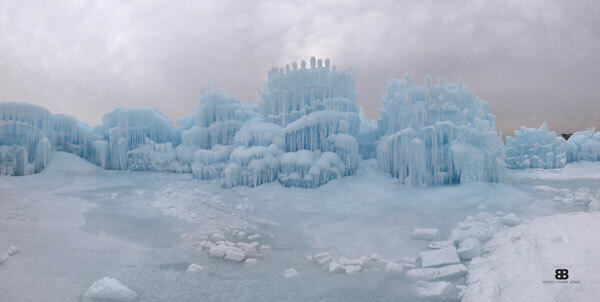 Since October, Ice Castles, LLC’s crew of 30 people have dedicated thousands of hours to creating the structure. What began as the brainchild of Brent Christensen, who crafted a small ice castle in his yard for his daughter to enjoy, is now a full-fledged entertainment company specializing in large-scale events handcrafted from ice. Currently, there are five Ice Castles throughout the United States and Canada, and each one is special. Beck oversees the miles of electrical and water lines necessary to keep the project operational, as well as helps with design and layout. Growing roughly 10,000 icicles every day and placing them throughout the Ice Castle, over time the icicles collect more water and absorb into the ice structure, resulting in a beautiful construction. Because water absorbs every other color of the spectrum, the ice appears blue to the human eye. The thicker the ice, the deeper the shade of blue. Visitors should set aside at least 30 minutes to explore the castle, but are welcome to stay longer. All are encouraged to dress warmly, and sleds are encouraged in lieu of strollers for young children. Despite the cold winter weather, braving the elements is completely worth the experience. All details are online at IceCastles.com.